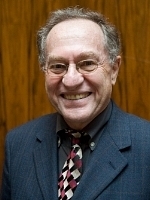 Professor Alan M. Dershowitz is a Brooklyn native who has been called “the nation’s most peripatetic civil liberties lawyer” and one of its “most distinguished defenders of individual rights,” “the best-known criminal lawyer in the world,” “the top lawyer of last resort.” He is the Felix Frankfurter Professor of Law, Emeritus, at Harvard Law School, and joined the Harvard Law School faculty at age 25. He has also published more than 1,000 articles in magazines. Professor Dershowitz is the author of 36 fiction and non-fiction works with a worldwide audience, including the New York Times #1 bestseller Chutzpah and five other national bestsellers. His autobiography, Taking the Stand: My Life in the Law, was published by Crown, a division of Random House. His writing has been praised by Truman Capote, Saul Bellow, William Styron, David Mamet, Aharon Appelfeld, A.B. Yehoshua, Elie Wiesel, Richard North Patterson, and Henry Louis Gates, Jr. More than a million of his books – translated in many languages – have been sold worldwide.